Over the next three months, employees of Ogilvy and Mather (O&M) in Mumbai will move to a new office in Goregaon. The agency’s departure, from its office at Kamla Mills in Lower Parel, a central Mumbai borough dotted with defunct textile mills, is evidence enough that India’s Madison Avenue is moving to Mumbai’s northern suburbs in an attempt to cut rising real estate costs, meet growing demands for space to accommodate a swelling workforce, and address employee requests asking agencies to move closer to where they live. O&M was one of the first agencies to set up base in Lower Parel in the late 1990s. The emergence of Lower Parel in the 1990s as an advertising hub was led by agencies such Saatchi and Saatchi, Mudra Group and Ogilvy & Mather India Ltd which moved out of Mumbai’s central business district in south Mumbai, to larger and cheaper office premises in central Mumbai. Their peers, including JWT India, Leo Burnett India, Lintas India Pvt. Ltd and McCann Erickson India Pvt. Ltd, followed suit by setting up their offices or moving a part of their operations to the area, known primarily for its defunct textile mills. “We were among the first to move to Lower Parel nine years ago, and this office has served us well. But as we grow, we need more space. In a creative job, you can’t expect people to give their best in a cramped environment," said Piyush Pandey, executive chairman and national creative director for O&M (India and South Asia). He added that the new office has been planned with an eye on future growth. It also helps that rents in Goregaon are lower than those at Lower Parel. Lower Parel is now being viewed as an emerging financial district, said Anuj Puri, chairman and country head, Jones Lang LaSalle Meghraj, a real estate consulting company. “Ten years ago, the real estate prices in Lower Parel were pegged at Rs55-60 per sq. ft per month. Today, the prices are in the Rs360-400 per sq. ft per month region," he added. 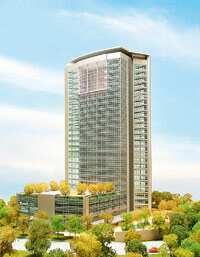 The going rate for real estate in Goregaon is pegged at Rs185-200 per sq. ft per month, according to estimates by Jones Lang LaSalle Meghraj. O&M isn’t the first agency to exit Lower Parel. In November, Contract moved to a larger office in Andheri, a western suburb. All of WPP’s media-buying agencies under the Group M banner have moved from Lower Parel to Vikhroli, an eastern suburb of Mumbai. “Group M’s collective billing of Rs4,000 crore will now behandled from our new office in Vikhroli," said Sridhar Ramasubramanian, group finance director, Group M.
Meanwhile, Starcom Mediavest is looking for a new office to accommodate all its current offices, across Parel, Prabhadevi, Dadar and Worli. “We should move into a new office premises within the next six months," said Ravi Kiran, chief executive officer, South Asia, Starcom Mediavest. The Mudra Group, which has offices spread over Parel, Mahim and Khar, plans to move out of central Mumbai in the next two years. “Going by the real estate prices today, I think it is safe to say that in the next few years, advertising agencies will have no option but to move their back offices to areas such as Panvel or Navi Mumbai," said Jude Fernandes, executive director, Mudra Group. Advertising executives say the offices of their clients are scattered across Mumbai’s suburbs anyway and thatclient servicing fromthe new offices will not bean issue.